By Service – STC Biologics, Inc. The time & cost savings of an integrated approach to developing products, not constrained by the boundaries of different departments, has been realized in smart cross-functional organizations. STC Biologics, Inc. is founded on such boundary-less merge of disciplines, as the knowledge of Biology, Process Development, Analytics, Formulation, & Regulatory Sciences is in one team body. Our pride in technical rigor, perseverance, critical thinking, and multidisciplinary collaborative work ethics bring agile resolution to technical hurdles and nimble development of products. As passionate developers of biotechnology products, we take it upon ourselves to become the experts on your product. We help our clients with phase-appropriate CMC strategy, while clearly outlining the risks and risk mitigation plans. Our management team has two decades of experience in the development of biologics, having written over 20 comparability protocols, numerous specification justifications, two dozen INDs, and 8 BLAs, with experience in the life cycle management of 5 approved biologics. We are uniquely positioned to guide our clients to develop an integrated CMC plan tied to preclinical and clinical development with a constant eye on regulatory expectations. We can help you through any aspect of CMC development, from technical development to CMO management, from design of studies to proposal reviews, from data reduction to writing reports and summary presentations. The selection of an expression system is determined by its ability to deliver high productivity with acceptable product quality. More than 70% of recombinant protein products are produced in CHO cells, typically from DUXB11, DG44, and CHOK1 lineages. NS0 and Sp2/0 murine myeloma cell lines, as well as PER.C6® human cells. Cell line development starts with construction of an expression vector carrying the cDNA encoding the recombinant protein. After vector transfection, host cells are subjected to selection pressure using selectable markers. To generate the cell line with adequate productivity and stability, hundreds to thousands of clones may have to be screened, first using only titer as selection criterion, and subsequently screening for cell growth and other cell characteristics, such as cell number, specific productivity, volumetric productivity, and clone stability, to enable selection of the top 4–6 clones for further evaluation in bioreactors, and ultimately selecting a final production clone with a backup clone. For biosimilar development, many companies screen up to 1,000 clones to identify the clones with the desired quality attributes; however, here at STC Biologics, the number of clones screened is drastically reduced since we have devised process methods to decouple the productivity characteristics from the critical quality attributes, such as glycosylation. This platform allows us to conduct process development activities on only the two best producers to develop a highly biosimilar product. Before initiating process development activities, target product and process profile is defined based on the available knowledge of the product class; for non-MAb novel products, the limited initial knowledge is supplemented by characterization and structure-activity studies conducted in parallel to process development. We have demonstrated that monitoring product quality and process robustness throughout process development is essential for producing a high quality product. Robust implementation of cell culture technology requires optimization of a number of variables, including (1) cell lines capable of producing the product at high yields; (2) reproducible and scalable upstream and downstream process that meets product quality needs; (3) appropriate culture monitoring methods that ensure batch to batch reproducibility; (4) process understanding to allow scale up; and (5) appropriate in-process analytical methods to track product quality. At STC Biologics, in addition to cell growth and productivity assays, we apply a panel of in-process assays that include intact mass, glycan map (if the protein is glycosylated), ion exchange HPLC, and RP-HPLC or HIC (depending on the product); for downstream process development, SDS-PAGE, HCP ELISA, size exclusion HPLC, and other assays (depending on the product) are added to monitor the removal of impurities. Bioassays are used to assess the potency of the product (e.g. enzyme activity for enzyme products). Upstream process development starts with media and feed optimization in shake flasks. Only fully chemically defined media consisting of amino acids, vitamins, trace elements, inorganic salts, lipids, and recombinant insulin or insulin-like growth factors are used. Growth conditions are optimized without compromising product quality by single-component titration, spent medium analysis, and medium blending. Various fed batch-feeding schemes are examined using a DOE approach. STC’s proprietary additives are used (if necessary) to modulate specific product attributes, such as glycosylation and charge variants. A capture step is developed at this stage to enable analysis of product quality. Optimization of feed composition and feeding strategy requires consideration of nutrient consumption, by-product accumulation, and the balance between promoting growth versus volumetric productivity. Subsequently, the cell culture process is scaled up to 1-3 L in disposable bioreactors. At this stage, physical parameters (i.e. temperature, gas flow rate, and agitation speed) and chemical parameters i(i.e. dissolved oxygen and carbon dioxide, pH, osmolality, redox potential, and metabolite levels of substrate, amino acids, and waste by-products) are optomized. Biological parameters used for determining the physiological state of the culture include viability and viable cell concentration. A temperature shift is often explored from 37°C to 30–35°C starting at 48-96 hours post inoculation to retain cells in G1 phase longer, delaying the onset of apoptosis. Once the process is developed it can be scaled up to 50 L at STC to produce non-GMP material. Our set up involves Sartorius DCU with disposable 3L Mobius bioreactors, as well as 5L, 15L and 50L from New Brunswick/Eppendorf. With a productivity between 2-5 g/L, a 50 L bioreactor run can yield up to 250 g of protein, which is often sufficient to support pre-clinical and toxicology studies in animals. Downstream process development is conducted in parallel by generating feeds at 1-3L scale, subjecting it first to depth filtration followed by a capture step. A typical purification process for MAbs includes viral inactivation, one to two chromatographic steps designed to remove certain process and product impurities, viral removal filtration, and UF/DF to reach the target protein concentration and formulation composition. Cation and anion exchange chromatography are frequently utilized to obtain a highly purified product. Other chromatography resins such as HIC, CHT, MEP, or HEA can also be used to remove product and process specific impurities. With extensive experience in pharmaceutical development and global commercialization of several biological products, STC Biologics can support your drug product development needs. Over the past few years STC Biologics has worked with a number of products that exhibited undesired toxicity or stability issues after they were brought into the clinic. These problems occurred because of the use of template processes and methods without sufficient understanding of the process and the product. Although some programs were able to fix the product/process issues, on average, they lost 6-12 months and spent between $2-10M dollars in clinical and manufacturing costs. At STC Biologics, we believe that early, abbreviated process and product characterization before pilot scale production can reduce the development risk and cost by defining the effects of process variables on the quality of the product. To characterize the process we will analyze the impact of different batches of media, temperature, DO and pH, feed amount and schedule on growth, titer and quality of the product. Understanding these parameters will ensure successful scale up and transfer between manufacturing facilities. Based on the detailed characterization data in combination with our expertise in regulatory requirements for product control, we strategize the selection and development of release and stability assays. To examine the stability indicating nature of assays, we employ forced degradation kinetic samples selected to generate ~10-40% degradation, avoiding extensive structural change. We continue to select assays that are both sensitive to degradation and that show multiple degradation species. From the use of platform MAb analytical methods to developing assays for complex proteins and in-process testing, we can support your analytical development needs in all project phases. At STC Biologics we have the capability to comprehensively characterize the structure, glycosylation, impurities, mechanisms of degradation, and biological activities of your biologics product (see our brochure on Integrating Bioassays into CMC Development). We apply orthogonal, specific, and sensitive analytical tools, including mass spectrometry (MS/MS on Q-ExactivePlus), HPLC, electrophoresis, ELISA, spectroscopy, and cell-based bioassays. Having established biosimilar product development characterization rigor, we analyze these data to generate a cohesive picture of the product and its unique features. With our high resolution Q-Exactive Orbitrap mass spectrometer, we are able to conduct intact mass analysis of a 150 kDa antibody with 2-3 Da mass accuracy, differentiate 5-10% deamidation (+1 Da) in a 50 kDa protein by intact mass, and do semi-quantitative glycovariant distribution analysis. We apply MS/MS feature to determine protein sequences and characterize degradation products and impurities in biological products. 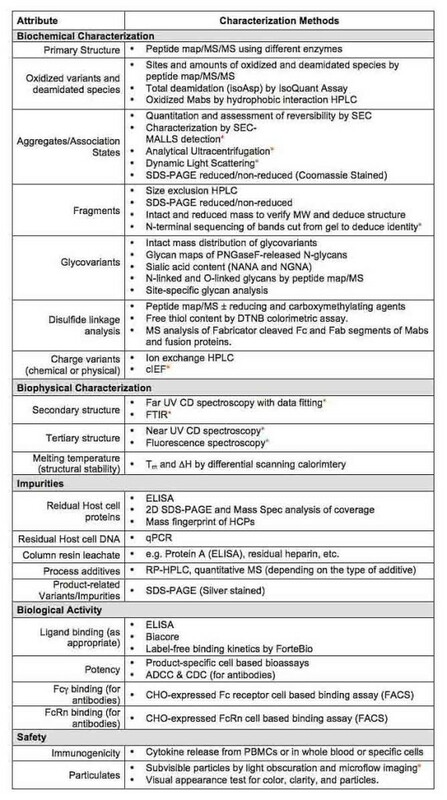 Target ID and HCP analysis is facilitated by peptide map/MS/MS combined with proteomics search tools. STC Biologics’ biological expertise combined with the regulatory knowledge has enabled us to establish robust bioanalytical services to measure concentration of your product in serum and blood. For each product we start with assay development to produce accurate and sensitive method of detection. We conduct MRD studies to understand the effect of matrix on accuracy of test article detection. To enable biologics development program, we can help your team establish PK and immunogenicity assays per regulatory guidance. STC Biologics is in the process of establishing GLP testing capabilities to validate bioanalytical assays and conduct analysis on clinical and toxicology samples. Examination of the biological activity is of uttermost importance during all phases of drug development; for example, to identify a development candidate with a desired biological activity and to make decisions around process conditions that meet the desired product profile. With broad knowledge of biology and experience in bioassay development, STC Biologics specializes in the development of custom biological assays specifically designed to examine your product’s mechanism of action. During assay development, critical assay parameters are identified and optimized for minimal variability. Each assay is qualified for specific sample matrix. Dose response curves are fitted for statistical best fit. When appropriate, relative potency is established in order to apply a parallel line analysis. System suitability criteria are established and selected assay parameters are statistically tracked to monitor assay performance. The stability indicating nature of the assay is assessed using forced degradation samples. Potency assays are qualified in early development and are later validated for their specificity, linearity, precision, robustness, and stability indicating nature. With a successful development of formulations for 5 marketed products and dozens of clinical stage development molecules, STC Biologics offers an integrated approach to biomolecule’s structural and biochemical stabilization by characterization of degradation pathways and link to the history of the molecule’s production and handling. Such an approach facilitates optimization of the manufacturing process to produce a stable high quality product. We begin formulation efforts with collecting information on the characteristics of the product, including primary sequence, pI, secondary and tertiary structures, potential sequence motifs susceptible to deamidation, oxidation and fragmentation, free thiols, etc. We have a systematic approach to designing forced degradation studies that would allow efficient development of stability indicating assays and highlight the types of degradation to stabilize against. STC Biologics will develop your final drug product’s manufacturing process based on the designed dosage form. Having 20+ years experience in developing biotherapeutic drug products, STC provides expertise in Pharmaceutics, liquid and lyo and liposomal product process development, and practical studies to support dosing, shipping, and expiration dating. STC Biologics is committed to high quality and well-documented processes, in line with GMP principles for product testing. We plan to offer GMP release testing and stability program for biotherapeutics by Q1 2016. The Quality Manual has already been written, and work towards the necessary Quality Systems and laboratory requirements is underway. STC Biologics can provide testing of the toxicology or preclinical batches, and set up stability studies under frozen, 2-8C, and accelerated conditions in support of those programs and in preparation for gaining experience with product’s stability profile. STC Biologics documents process and analytical development efforts in formats that are suitable for knowledge transfer to a GMP production site or testing laboratory. For transfer of analytical methods, qualified test methods containing system suitability criteria, and method qualification reports containing details of method understanding will be provided to the CRO. STC has successfully transferred several drug substance or drug product processes to sites in the US and the EU, and is familiar with the logistics and challenges faced to achieve such successes. Our staff will be available for scientist-to-scientist discussions to ensure complete knowledge transfer. STC Biologics has the knowledge and capability to provide oversight and project management of the GMP production CMOs or analytical CROs. Project management and technical oversight of tech transfer, scale down, scale up, and production/testing. With a track record of global commercialization of five biologics and developing dozens of products from preclinical to late stage clinical studies, STC’s team is in a unique position to develop your products with an in-depth understanding of current US and EU regulatory expectations. We have successfully prepared for numerous regulatory agency meetings, responded to agency questions, and authored complete CMC sections. We have managed response to urgent situations such as lifting clinical hold and major objections that were delaying approvals. We tell the story of your product in regulatory submissions with phase-appropriate level of detail.